LSF's latest combines rock resonance, pop overtones, and gleeful melodies resulting in, yes, another conscientious brand of Emotionally tilted Indie tunes with a penthouse-level production; here, compliments of the renowned Ed Rose, who also lends additional percussion and programming to this latest Spring semester score. Building on the harder rock resistance of their past, one that began only four years prior, and the harmonic elements commonly found with traditional AOR practitioners, LSF's sound is crisp and clean and serious all the way around. Tracks like "Don't Ask Why" or "On My Way" place the listener in the middle of the troubled relationship with extra emphasis on the catchy chorus as well as a pain-easing, been there before lament that lessens the blow for all concerned; "Euclid Crashed" is an acoustic ballad that stands out for the graceful addition of Stephanie Gunther's shared vocal tradeoff on this chapter closer, while "Around Again" employs a meaty three chord progression that's a catchy vibe before breaking into a done to death community chorus. "Long Ride Home" rides an opening reverb over a languid tempo and sea dragging vox while "Another Song," also briefly featuring Gunther's vox, at the close, is worth mentioning for its up-tempo style and sing along quality. In all "sincerity", which is a trademark quality of LSF's latest, seven of the thirteen songs raise it above also ran status but some of the rest -- "Looking Glass," "The Getaway--" there's only a 40 second tune called "10:18 Press Return" so we'll boost their overall score up a notch -- need not have been applied. With too many tracks, redundancy sets in to the point where we've heard it all before and what's to push us to keep listening and push them beyond sophomoric among the name brand competition like The Get Up Kids or The Anniversary? Cut a bit of fat here by reworking a couple of choruses, emphasize the backing vox, redefine a tempo or two, a little more mood, maybe spread a songwriting credit or two and break through the monotony of this strained relationship that strikes again and again -- Hint: re-examine a tune like "Prize Fighter" or "The Language Of Nature"; There's plenty of time to nod off later. 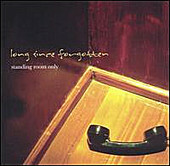 LSF's good at what they do, if we're to define "Emo" music for what it is, melodic, soulful, guitar Rock and mature lyrics, but is "Standing Room Only" good enough to not only compete but surpass the expectations previously set by some that LSF may be the one drawing comparisons from others? Close, but not quite there.